I used to pride myself on getting a house completely unpacked, pictures hung and EVERYTHING in only two weeks. We’ve moved so many times in the past 15 years I had it DOWN. I’d just look at Craig upon moving in and say, “Two weeks.” Presto, two weeks later it was done. We’ve been in this house for 7.5 weeks now and guess what? I’m still not done. I’m blaming a significant portion of that on the fact that I’ve never painted rooms immediately upon moving in before and so far have painted Craig’s study, Millie’s room, the entry way/stairwell/upstairs hallway, and put a third coat on our kitchen plus painted the laundry room. I paint ceilings too. Y’all, that’s a lot of painting. The other thing I’m blaming my delay on is being 37. I’ve discovered the older I get the harder it is to pull off this whole “Let’s move again!” thing. In fact, I don’t think I ever want to do it again. Ever. Also, we didn’t have any bookshelves when we got here despite the fact that we did bring all of our books. It’s taken time to gather a new round of those here in Oklahoma City. It finally happened this week when I hit the jackpot by way of the OU Property Control surplus sale. Apparently they are normally open to the public on Wednesdays, but this week they had a unique situation going in that they are preparing for the demolition of one of their buildings. Rather than move everything inside that building over to their surplus site, they hosted a public 3-day sale in which all their awesome stuff that was already cheap on Wednesday became 25% cheaper on Thursday and 50% cheaper on Friday. I picked up three old university wooden bookshelves (think: tall, wide, STURDY, and already assembled!) for $20 each. On Thursday I went back for 3 more, then $15 each. I also got two old wooden desk chairs, one of which I’m sitting in right now and I love it. Piano benches are completely overrated as desk chairs. Anyway, all that to say that while I still don’t have ALL the boxes of books unpacked, we’re much much closer than we were before Wednesday and that’s feeling pretty darn good. 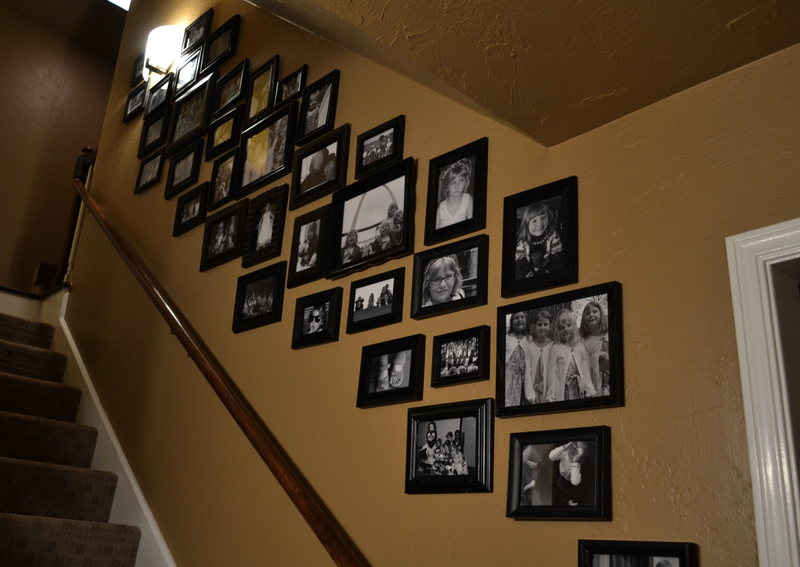 I still have a significant amount of work organizing all the various closets this house has and aside for the pictures you see above, we haven’t hung much yet either. But it will eventually happen. It always does. This time it’s just taking a lot longer than it used to. Love the color and the photos on the stairs! You are still super-woman to me! Glad the house is finally coming together and starting to feel like home! you might have to put an interesting part of the house on your header:)…once it’s the way you want it. I am with you, on the age thing. We moved almost every 3 years when we were fist married. I could do the pack and move with my eyes closed…or so it seemed. Now, I wear out a lot sooner! Enjoying your blog and I’ve subscribed. Thank you for this! The last time we moved, I recall that conflict between getting stuff done and everything else we needed to do. Like eat and sleep! I hope you’re doing well. And thanks to this, no, we won’t EVER move again. Unless something awesomely cool happens. Love the photos up the staircase. We have similar stairs and I’ve been wanting to get some photos up 🙂 You’ve inspired me!!! Thanks Aubrey! It really is starting to feel like home. Finally.